You might have heard that The Cure's former guitarist Porl Thompson currently auctions some of his instruments - including this strange 8-string hybrid bass/guitar. I cannot figure out what is the device under the strings - my first idea was some kind of adjustable buzzing thing turning it into a guitar sitar, but it seems much more complicated that the buzz bridge or saddles one can use for that purpose (as you can see here). The instrument has 6 guitar strings and 2 bass ones with a much longer scale - hence a fretboard divided in two parts with two different nuts - simple but effective (though much less elegant than fanned frets) - and it makes sense - when I play bass I mostly use the 2 lower strings... It's quite an inspiring instrument in my opinion, anybody know anything about it and its features - and was it ever used with The Cure? Edit: thanks to our Facebook page, this guitar has been identified as a Carter Custom Hybrid 8 - there are no detailed explanations about what they call the "Dampler Strikers" but the photos show a.o. that there is more room under the strings that it seems... More comments are welcome! Labels: 8-string, bass, custom, hybrid guitar, one-offs, What's that guitar? I wonder if the device under the strings is some sort of muting mechanism? odd. My first thought was they they are hammers, like in a piano. Aren't they piano-type keys that will strike the strings? Looks like its designed for a left-hander to play, is Porl a southpaw? Could this be a keyed guitar? Instead of pluck or strum you press a key for the string(s) and it either hammers (like piano) or plucks (harpsicord) the strings. It looks to me like a guitar crossed with a piano - and those are the hammers. Never seen it in use but "the device under the strings" looks like it might be a set of keys to enable the instrument to be struck rather than strummed? That said, there doesn't appear to be much room for "travel", nor much chance that if you hit the first, "bass" key that you wouldn't hit all the other 7 strings doing so. There also looks to be a lot of crosstalk where the middle strings cross both pickups. Really weird instrument and strange that there is nothing much on the net about it - I guess without a special name we're stuck with very wide search results. Yeah my first thought also was that it looks more like hammers, it would make more sense. But I bet they also would produce a buzzing sound and maybe even harmonics if used right. It's gotta be hammers! Christian of Fleet Foxes has a Hagstrom 12-string electric that he's modified for hammered playing. I've done some work on that guitar, and I can tell you first hand that it's an alluring tone. Christian's guitar has hammers mounted on very thin metal arms, enabling a sort of far-east dulcimer sound. These hammers can also be used for a more piano-like tone, but it's a tricky technique for certain. Really cool sounds there. The hammers on this one seem much more solid, which would be more in keeping with a piano-esque vibe. Pretty great. hammer/dampner. that answers that. Was really wishing for a harpisacord pluck thing there. Great Blog men! Nice post about the Porl Thompson's one-off 8-string guitar. Maybe you can visit my site too at Fender CD 60 Acoustic Guitar. It is about the fender cd 60 acoustic guitar. Fender CD 60 acoustic guitar is one of the most high ranking fender guitar. I'm going to guess that it's actually not about the hammers "striking" the string so much as muting certain strings. 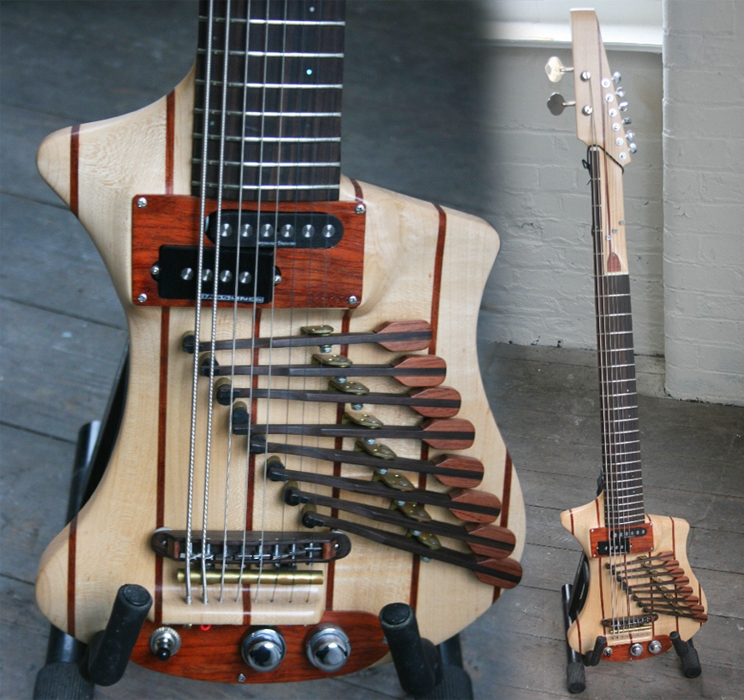 It'd be a quick and ingenious way to use that wide palette of a fingerboard in many different configurations. But if it's a piano guitar, cool!! "They do work to mute stings individually but they work better for striking the string. More like a dulcimer than a piano key strike. Feel free to contact me with any questions."